I struggle with the lunch box dilemma every week. My child is a lot like me in that she must have variety. I have friends who talk about how their kids eat the same lunch day after day, but I could never pull that off with the Vivver. She can be really gung-ho about a certain food, but if you overdo it, she’ll turn off real quick. So each week, I cruise the grocery store looking for inspiration, new ideas, something, anything. One thing we don’t do is the stuff I always wanted as a kid…Little Debbies, Doritos, cookies. Yep, I’m one of those moms who tries to keep my baby away from processed food in a bag. I was recently asked to do a cooking lesson for Vivi’s Girl Scout troop. The group consists of Daisies (Kindergarten-1st grade), Brownies (2nd & 3rd) and Juniors. The Girl Scout guide suggests teaching healthy snacks, but I thought to myself “Snacks? That’s not exactly cooking, now is it?” So, I put some thought into what snacky ideas could actually teach some cooking skills and still be age appropriate. I’ll be blogging more about this once I get the photos (yep, I asked a friend to be my photographer). It was a great time with all those little girls in the kitchen! 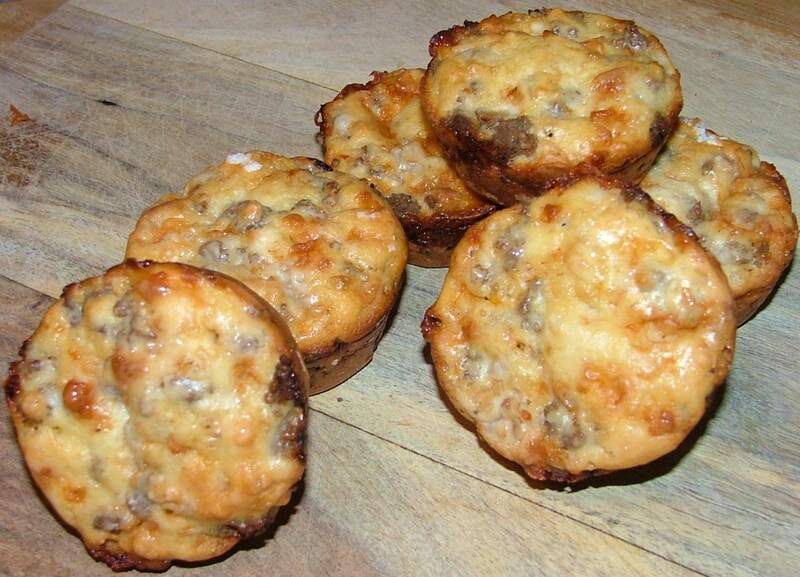 But one thing I wanted to go ahead and share now were the Mini-Cheeseburger Pies. This is a recipe by Betty Crocker…I did not make it up. I made it with the Girl Scouts and all of them loved it- including my little one. Then, I had a light bulb moment and realized this would taste just as good at room temperature, so it’s a lunch box candidate! So, last night I made another batch. As usual with me, I tweaked it a tad. For instance, I used a little less than 1 lb of meat, used a little bit more cheddar, a little more Worchestershire (this gives it a great little kick of flavor), and I sauteed a pretty good portion of onion. The result was a 10. I ate two of them right out of the oven! This morning, I heated a couple in the microwave then wrapped in foil, hoping that would keep them a bit warm for Vivi’s lunch. I can’t wait to get her review after school today. Now, I will admit that this isn’t the most low fat recipe, but since my child is extremely active and burns it up with karate, ballet, basketball, I don’t worry so much about that. Of course, using turkey will be just fine, I’m sure, so that’s one way to lighten the fat. I think this recipe also lends itself to sneaking in other vegetables that won’t really interfere with the “cheeseburger” nature of the pies. If you want to try it out on your kids, here is the recipe. If you try a new twist to the recipe, I’d love to hear about it below! This entry was posted in Elizabeth Webber Akre, Food and tagged Columbia, columbia sc, elizabeth akre, Elizabeth Webber Akre, every woman blog, Famously Hot, food, hospital blog, Lexington, lexington medical center., lexington sc, Lexington Women, lmc, LMC every woman blogger, Midlands, Midlands Women, Recipes, School lunch, South Carolina, South Carolina Women, Women, women's blog, women's hospital blog by Kate Gillmer. Bookmark the permalink.